Manam antha mana favourite heroes ni on screen mida chusi, hit or flop tho sambandam lekunda matallo cheppaleni feel and emotional experience pondutham. Just mana favourite heroes ne chustune intha kick ante inka vari pakkana inkoka hero add aithay aa kick ea veru appa. On screen or off screen oka hero movie or audio, pre release, and success meet lo inko hero ravadam fan wars annitiki full stop pettadam at the same time it treat to watch for fans of respective heroes ani chepocchu. Ila oka hero movie functions ki inko hero velladam, movie paina tweets pettadam, Ram Charan – NTR – Mahesh lanti filmy functions ea kadu personal ga kalisi get together parties chesukovadam lantivi oka healthy atmosphere and ambience ni crete chestunnayi mana tollywood lo. Appatlo Badri movie opening lo Pawan – Mahesh incident nundi Aravindha Sametha success meet lo Balayya- NTR- Kalyan Ram off screen presence varaku konni incidents ento once check cheddam. Nandamuri fans eppudu eppuda ani wait chestunna time rane vachindi. Nandamuri nata varasulu trio Kalyan Ram – Balakrishna – Jr NTR la ni oka stage mida chudali anna fans korika inni rojulaki set aindi. Ee mugguri Babai-Abbai la sammelanam chusi andariki oka treat to watch moment lantidi. Mega family madhya edo jaruguthondi anna gossips first nundi unnave vatiki annitiki check peduthu varu antha kalisi oka stage paina kanipinchina incidents chala ne unnayi andulo konni incidents oka sari chuseddam. Oke family heroes kalavadam common ea kani, other heroes functions lo inko hero ravadam anedi chala rare. And andulo first chepkovalsindi Jr NTR and Pawan Kalyan Aravindha Sametha opening ceremony incident okati. Ee Babai – Abbai paiki kanapadak poina oakru ante entha istamo chala incidents lo prove aindi andulo konni incidents Nayak audio release, and rangasthalam success meet lo villa iddarini chusina mega fans pandaga cheskunnaru. 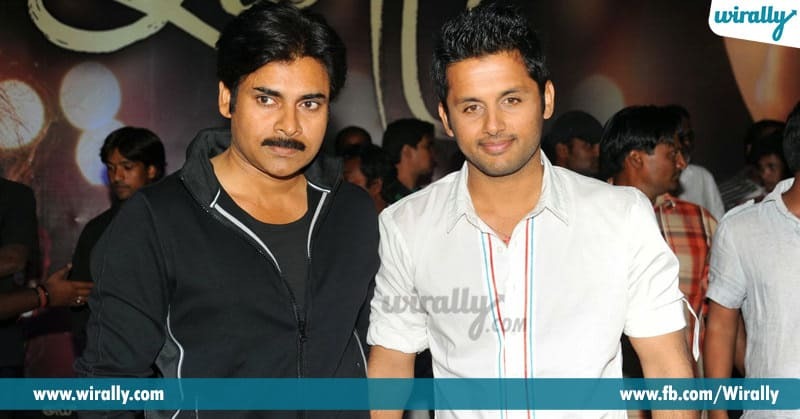 Nithin Pawan Kalyan ki die hard fan anna vishayam appati varaku evariki teliyadu. Nenu mee fan meeru na Ishq movie audio release ki ravali anna oka fan request ni accept chesthu Pawan aa audio release ki velladam Nithin ni bless cheyadam evaru marchipoledu. Ee iddaru eppudu kalisarabba ane doubt miku vache untadi. 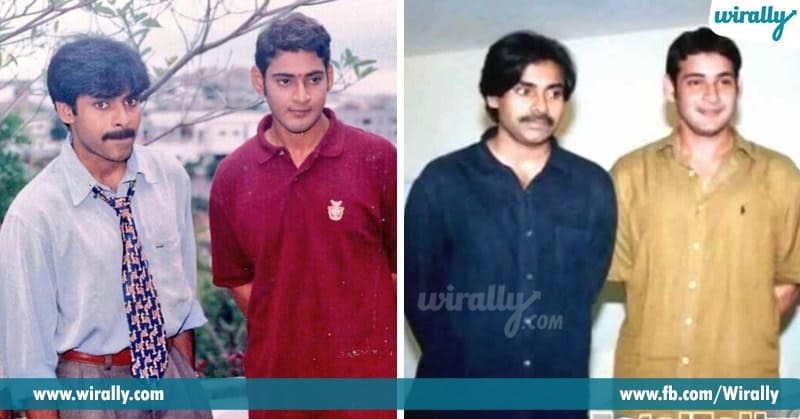 Long time ago Puri ‘Badri’ movie opening ki Mahesh vacchadu. And aa taruvatha Arjun movie piracy vishayam lo kuda iddaru kalisi fight chesina incident manalo chala mandiki teliyadu. Nela Ticket audio release event lo Mass Maharaja Ravi Teja tho kalisi Pawan some stage share chesukunadu. And ee iddaru okari gurinchi okaru chepkuni fans lo oka healthy atmosphere create chesaru. 8. 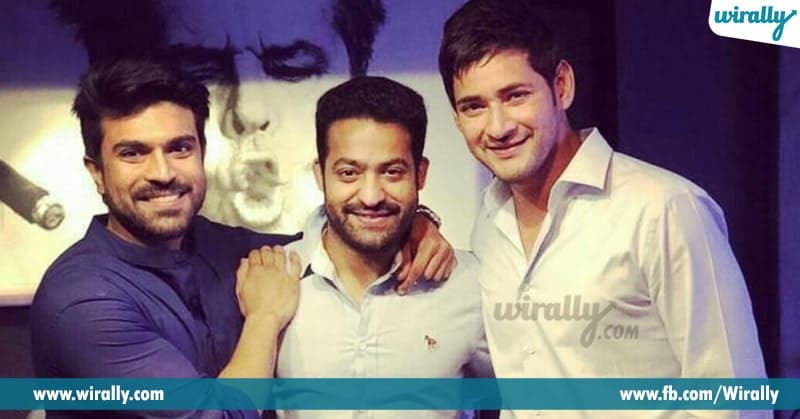 Mahesh Babu – Jr NTR – Ram Charan. Mugguru industry lo pedda stars, three families madya box office daggara oka competition untundi. Ika fans gurinchi aithay chepoddu ma hero thopu ante maa hero thopu ani antaru. Ivi anni miku matrame memu memu bagane untam message isthu ee mugguru kalisina private function photos gurinchi mana andariki telsindey. And ee friendship tho ea Tarak “Bharat Ane Nenu” pre-release ki kuda vachi ee iddaru heroes fans andariki malli okasari message iccharu. Bunny maa family ni pakkana pedithe naku nacchina favourite hero Prabhas ani Arya 2 audio release lo cheppina vishayam mana andariki telsindey. 10. 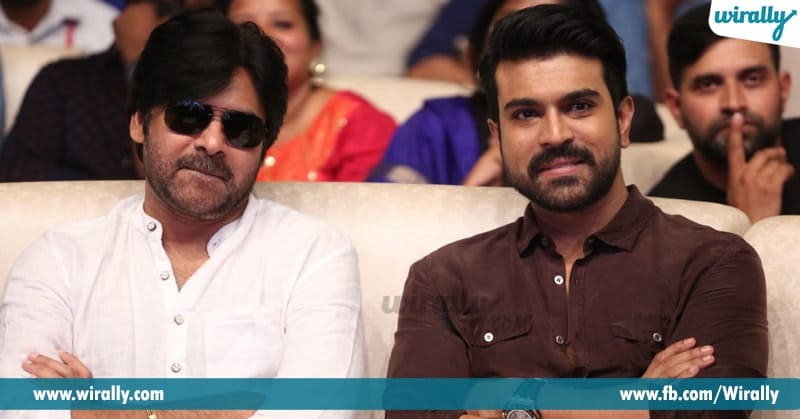 Nag- Chiru – Charan & Akhil. Akkineni and Mega families madya unna bonding elantido andariki telsinde. 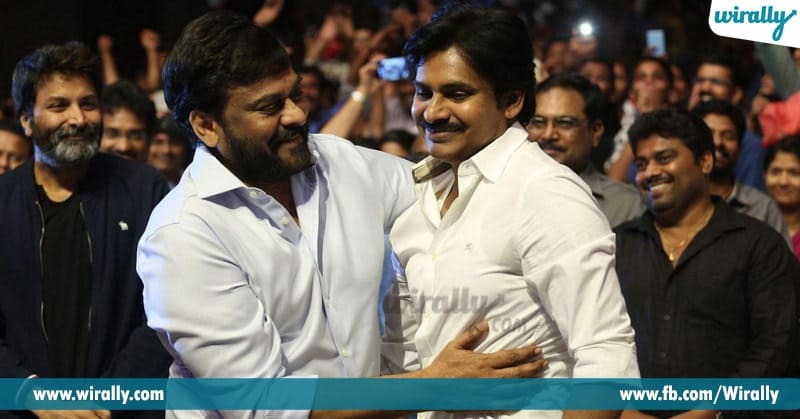 And bonding valle Akhil hello movie pre-release event ki Chiranjeevi and Ram Charan iddaru vacchi Akhil ni wish chesaru. Kalyan Ram produce chesina ee Kick 2 movie ki Jr NTR guest ga vacchadu. 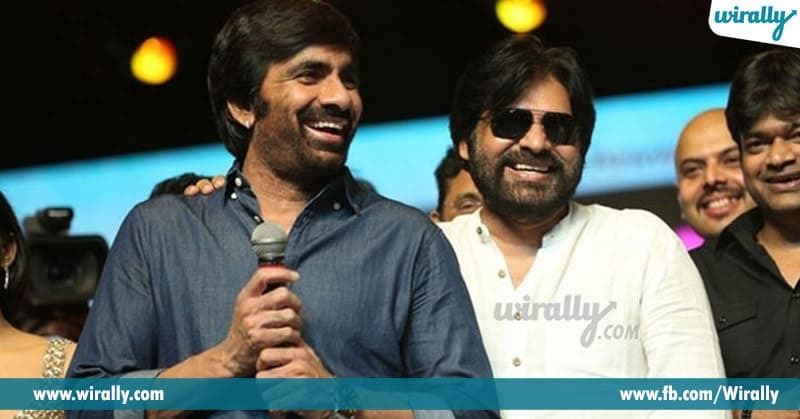 Ala oke stage oka side brothers iddaru kalisi Ravi Teja tho stage share chesukoni best wishes chepparu. 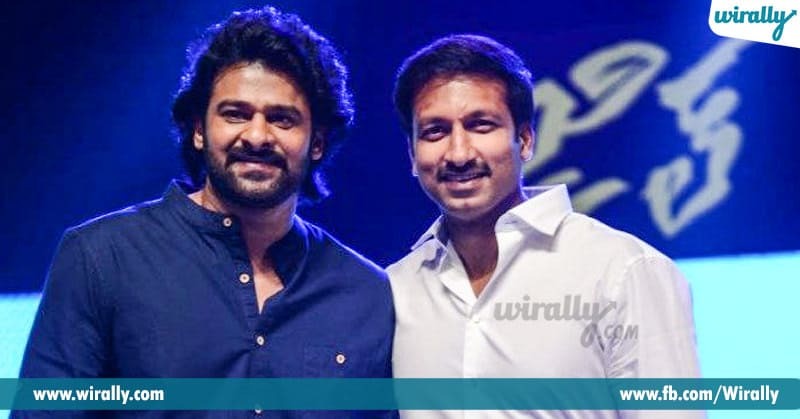 Prabhas and Gopichand entha close friends oo andariki telusu and ee Varsham movie lo Prabhas ko opposite role chesi hero aina Gopi kosam Prabhas couple of times audio functions ki vacchadu. 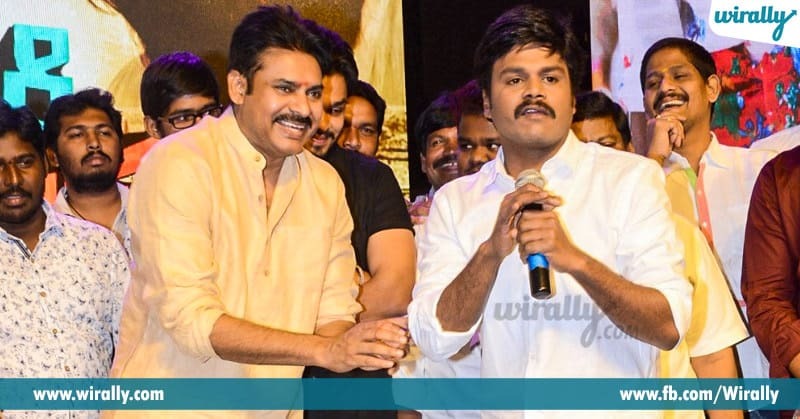 Pawan ki ‘Katamarayudu’ title ichadu anna kruthagnatha tho Saptagiri Express audio release event ki vacchi hero turned comedian ki best wishes cheppadu. 15. 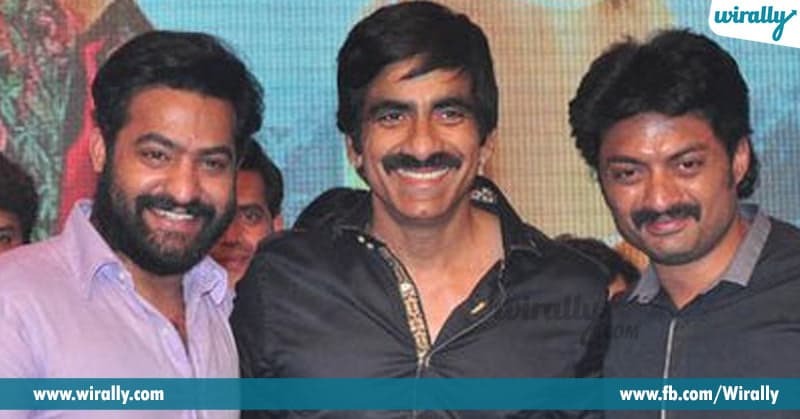 Allu Arjun – Ravi Teja – Kalyan Ram – Jr NTR. SS Rajamouli Baahubali lanti Magnum Opus taruvatha chestunna movie and andulo Jr NTR & Ram Charan huge combination. 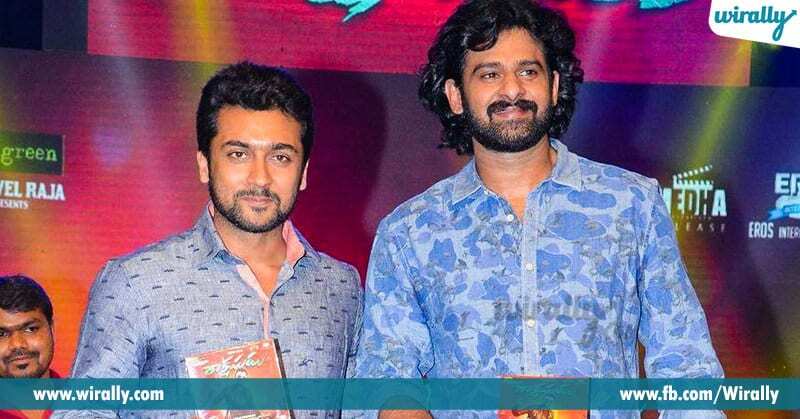 Andaru eppudu eppuda ani wait chesthunna ee movie launch recent ga jarigindi ee function ki Chiranjeevi daggra nundi NTR, Charan, Prabhas, Rana, Kalyan Ram lanti stars antha vacharu. Ee pics ninnati nundi entha viral avtunnayo mana andariki telusu mari akkada antha mandi heroes unte aa matram viral avadam common ea. Ila ee madya kalam heroes ego’s, competitions, fan wars, lanti unnecessary things ki full stop peduthu chestunna ee efforts ni fans antha follow avuthu fan wars ki full stop petti oka healthy nature ni alvatu cheskovlasina avasaram enthaina undi.